Originally, army circles had announced Lynch had fought especially bravely and defended herself fiercely until she ran out of ammunition. Now it is reported that she was not able to shoot at all because her weapon was jammed. The doctors who treated Lynch in the small town of Nassirija said later that Lynch did not have bullet wounds but broken bones and a surface wound on the head. Today even the US Army assumes that Lynch's injuries are due to a car accident where Lynch's car collided with another car from an US convoy. In the Army report published two weeks ago one can read that non-ready guns, erroneous navigation, and exhaustion were responsible for death and imprisonment of the US soldiers. The spectacular rescue of the US Army on April 2nd today is exposed as propaganda: At night US soldiers stormed the hospital in which Lynch was treated. The whole action was filmed. 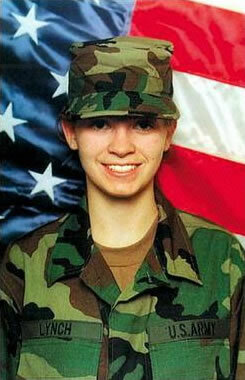 "We are grateful for the excellent and brave rescue of private Jessica Lynch," said defence minister Donald Rumsfeld to the American public. The Iraqi doctors in Nassirija reported they had offered to hand over Lynch before the hospital was taken over. But when the ambulance with the soldier approached a checkpoint the Americans released warning shots. Then the driver returned to the hospital. According to the doctors, the spectacular military action in the hospital was not necessary: Hours before the US attack not one single weaponed person remained in the hospital. John MacArthur, editor of Harper's Magazine said on the occasion of Lynch's return: "In America it doesn't matter any more what is right or wrong. The public is conditioned to believe everything: no matter if it is emotional stories or lies on weapons of mass destruction." Stan Goff, "The Use and Abuse of a Woman Soldier. Jessica Lynch, Plural," CounterPunch, December 13/14, 2003. Greg Mitchell, Congressional Report Reveals How Press Got Spun on Jessica Lynch", Editor & Publisher, July 14, 2008. This page was last edited on 24 February 2010, at 04:57.